Consumer surplus is a valuable concept that can help appraisers understand what is and is not property value in hotels. Readers can think of consumer surplus as the difference between what a buyer is willing to pay for an item and that item’s market price. If you are willing to pay $5.00 for a gallon of milk, but the local supermarket price is only $3.49, then you can enjoy a consumer surplus of $1.51 by purchasing the gallon of milk. In this example, the market price, or market value, of a gallon of milk is $3.49, even though at least one buyer would be willing to pay more. The market value of an item can be higher or lower than the price various individuals are willing to pay. The most probable price, as of a specified date, in cash, or in terms equivalent to cash, or in other precisely revealed terms, for which the specified property rights should sell after reasonable exposure in a competitive market under all conditions requisite to a fair sale, with the buyer and seller each acting prudently, knowledgeably, and for self-interest, and assuming that neither is under undue duress. There are many definitions of market value. In general, these definitions focus on determining the price at which something would trade in a competitive marketplace. Graphically, consumer surplus represents the area between a demand curve and the market price of whatever is being traded. 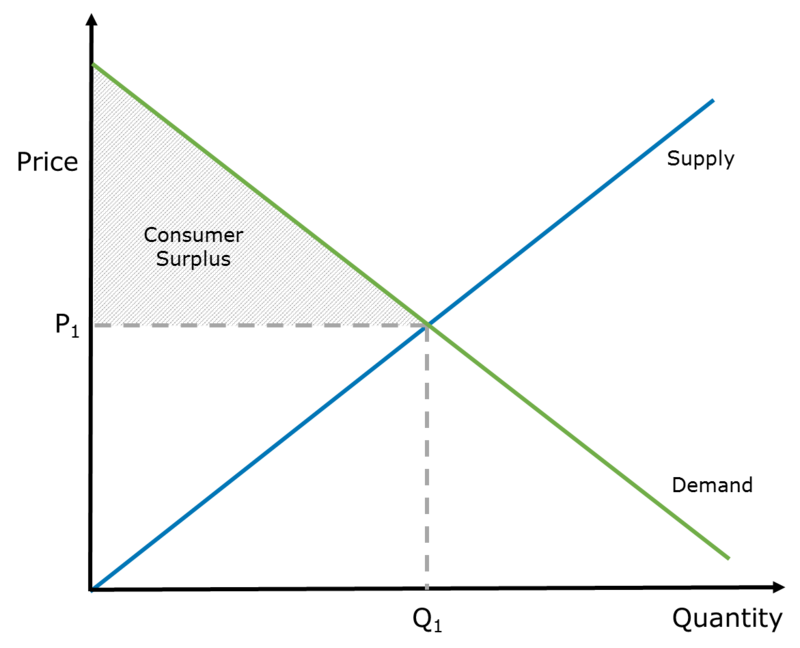 The following figure shows the consumer surplus in the shaded area, below the demand curve, above the market price P1. In the graph, the blue line represents a supply curve and the green line represents a demand curve, for an item actively bought and sold in a market. P1 represents the market price at which supply and demand are in equilibrium, at a given time, for this item. Q1 represents the quantity of the item that will be supplied by vendors, given the market price. If your demand for the item lies somewhere on the left half of the green demand curve, then you will happily pay the market price for the item. The amount of consumer surplus you will enjoy depends on how far above P1 you are located on the demand curve. On the other hand, if your demand lies somewhere on the right half of the green demand curve, below P1, then you will not purchase the item because its market price exceeds what it is worth to you. Now let’s assume you are developing a hotel instead of purchasing a gallon of milk. To develop a functional hotel, you will need to purchase beds, and various other furniture, fixtures, and equipment items. These items collectively make up a hotel’s tangible personal property. In this example, let’s assume you need to purchase 100 beds for your new hotel. There are many sellers and buyers of new hotel beds, creating an active and competitive market. There are multiple suppliers that meet all the specifications and brand standards you are seeking. After comparing various suppliers, you determine that the market price for the particular type of bed you want is $800 per bed, or $80,000 for 100 beds. Regardless of how much you are willing to pay for the beds, the market price is $800 per bed. Even if the beds are worth more than this to you, you do not need to pay more than the market price. Imagine a vendor offering to sell you the beds for $1,000 each, because that is how much they may be worth to you. Even if they are worth this much to you, it still would not make sense to pay this amount, as you could obtain the same beds from another vendor for $800 each. In a property tax case involving a hotel I recently appraised, the hotel owner’s attorney argued that the hotel’s tangible personal property was worth significantly more than its replacement cost. This seemed unlikely. So, I asked whether she believed the used furniture in the owner’s hotel really was worth more than it would cost to buy the same items brand new? She answered no. But she then went on to argue that the “contributory value” of the furniture was much higher than the cost of the furniture because without beds nobody would stay at the hotel and the whole operation would go out of business. It may be true that a hotel’s furniture is worth more to a hotel owner than the cost of the furniture, just as a gallon of milk may be worth more than its market price to some consumers. But this does not mean its market value is greater than its cost. The market cost, or market price, of the furniture represents its market value. Any difference between its market value and its value to an owner represents consumer surplus. When valuing hotels, appraisers may recognize these properties include various components, such as land, improvements, and tangible personal property. Appraisers may also recognize that all of these components are needed, and must work together, to achieve the highest and best use of such properties. However, just because tangible personal property is necessary to achieve a hotel’s highest and best use does not mean an owner will be forced to pay the maximum amount the owner is willing to pay. This would require suppliers to practice perfect price discrimination. A detailed discussion of the conditions necessary for perfect price discrimination is beyond the scope of this article. But suppliers in such a competitive market as hotel furniture are not likely to achieve much price discrimination, if any. So, if an appraiser estimates how much value the tangible personal property of a hotel contributes to its owner, then the appraiser is probably not estimating market value. Instead, the appraiser is really estimating the sum of its market value plus the owner’s consumer surplus. The Appraisal Institute, The Appraisal of Real Estate, 13th Edition (Chicago: The Appraisal Institute, 2008), 22-23. Assuming the conditions apply that are required to meet the definition of market value. Hans Detlefsen, MPP, MAI is president of Hotel Appraisers & Advisors, LLC, an advisory firm specializing in the hotel industry. Mr. Detlefsen is a designated member of the Appraisal Institute. Prior to forming Hotel Appraisers & Advisors, Hans was owner and Managing Director of the Chicago office of HVS, a global hospitality consulting firm. He received his B.A. from the University of Notre Dame and his M.P.P. from the University of Chicago. Hans is a frequent speaker at industry conferences and has been cited in numerous business journals and trade publications.